A league-high nine members of the University of Oklahoma football team were named to the 2016 Preseason All-Big 12 Football Team, announced Wednesday by the conference. The teams were chosen by media representatives who cover the league. 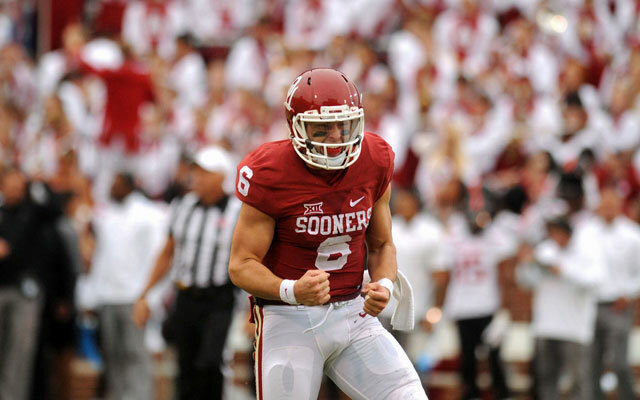 Leading the way was junior quarterback Baker Mayfield, who was chosen as the Offensive Player of the Year. He was joined by junior running back Samaje Perine, sophomore receiver Mark Andrews and sophomore tackle Orlando Brown on the offense. Defensively, OU was represented by senior linebacker Jordan Evans, junior defensive lineman Charles Walker, junior defensive backs Steven Parker and Jordan Thomas and sophomore punter Austin Seibert. Oklahoma’s four offensive selections and five defensive honorees led the league on each side of the ball, while the nine picks in total were nearly twice as many as the next closest team, Kansas State (5). Texas had four total selections, Oklahoma State and TCU each had three, Baylor, Iowa state and West Virginia had two apiece and Texas Tech had one. The nine selections for OU were its most since also having nine picks on the 2011 Preseason All-Big 12 Team. Mayfield is coming off a season where he was the 2015 Big 12 Offensive Player of the Year, the Sporting News Player of the Year, a first-team All-American (Sporting News, Walter Camp) and the winner of the Burlsworth Trophy as the nation’s top player who began his career as a walk-on. He threw for 3,700 yards and 36 touchdowns to just seven interceptions en route to finishing fourth in Heisman Trophy voting. The only player to repeat from last year’s preseason squad, Perine ran for 1,349 yards a year ago with 16 touchdowns. He was named to the All-Big 12 First Team and received All-America recognition from Phil Steele (third team) and Sports Illustrated (honorable mention). Perine has 3,062 career rushing yards and needs 1,056 to tie Billy Sims as OU’s all-time leader. In his first season of competition last year, Andrews emerged as a dangerous red-zone target. Of his 19 receptions, seven went for touchdowns. He finished with 318 receiving yards and averaged 16.7 yards per catch, earning All-Big 12 Second Team honors from the league’s coaches. Brown started every contest last year at left tackle and became one of 10 freshmen in OU history to start a game at offensive tackle. He earned Freshman All-America honors from Sporting News and All-Big 12 honorable mention recognition from the league’s coaches. The lone returning starting linebacker for OU, Evans will look to build on a productive junior season when he tallied 83 tackles (his 7.5 stops per game ranked sixth in the league), including 5.0 tackles for loss and 1.0 sack, four pass breakups, one forced fumble and a fumble recovery returned for a touchdown. He was named All-Big 12 Second Team by the Big 12 coaches. Like Evans, Walker was also tabbed for the All-Big 12 Second Team a year ago. He is OU’s leading returner in both tackles for loss (10.0) and sacks (6.0). He recorded 36 tackles, one forced fumble and a pass breakup as a sophomore. Parker started all 13 games last season with eight coming at strong safety, three at free safety and two at nickelback. He produced 60 tackles to go with 4.0 tackles for loss and 1.5 sacks, four pass breakups and a fumble recovery. He was also named All-Big 12 Second Team by the coaches. With five interceptions a year ago, Thomas is tied for the most picks of any returning player in the Big 12. A first-team All-Big 12 honoree by ESPN.com, Thomas registered 46 tackles with four pass breakups in addition to his interceptions.